Image used here under fair use for review purposes. It’s that time of year again, in Disney’s new “movie a year” plan for Star Wars. Rogue One: A Star Wars Story, according to the trailers, is meant to be the immediate prequel to Episode IV. Given my experience last year, I kept myself insulated from pre-opening reviews, and went in with low expectations and an open mind. Spoilers ahead as I review Rogue One. Star Wars: Rogue One is set in the days immediately before the beginning of Episode IV, where it’s the story about how the Death Star plans ended up in the hands of the Rebel Alliance. It has the look of the original trilogy, sideburns and all, but feels so formulaic that a lot of warning flags started flashing up as it unfolded in front of my eyes. So let’s get to it. There’s nothing good to say here. The characters are entirely forgettable cardboard cut-outs with no depth or memorability. Within an hour of leaving the theatre, I was already having problems remembering their names. Without looking it up, I think that the main character’s name was “Jen” or maybe “Jan”, and after that it’s just vague descriptions. French spy, French-ish/Harki(?) pilot, Irish saboteur, sassy droid, Forest Whitaker, plot Dad, dead Mom, blind Asian martial artist, Asian with a machine-blaster, and evil project director. The main character is Jyn Erso, played by Felicity Jones (I looked it up). She’s a product directly out of the Hollywood American heroic badass character extruder, with the gender switch flipped to “female”. Her in film skills are good, and explained well by her back story of being raised by a militant, but her motivations are absolute garbage. She also goes through the predictable and frankly tiresome “I don’t care, it’s all about me!” to “I’m now an inspirational leader that you all have known for like, two days, but I totally have clout and authority!” development arc after she sees a hologram of her Dad saying he loved her. All in the course of like, less than 24 hours. Further, her petty moralizing is irritating, and her attempts to take the high moral ground, and later to parrot back “Rebellions are built on hope.” are just painful. The other protagonist of note is Captain Cassian Andor, played by Diego Luna. An intelligence officer, he’s supposed to come across as hard bitten and haunted by his actions in the murky world of commandos and field intelligence. It just doesn’t come through well. For a character whose hands are supposedly covered with blood, he comes across as trigger shy and not nearly as ruthless as when he first appears and kills two Stormtroopers then the contact he was talking to. After that, he goes soft pretty quick. It lead to a confused idea of his character as portrayed on screen. It’s a sad day when it’s a CGI resurrected Peter Cushing as Grand Moff Tarkin and James Earl Jones voiced Darth Vader that dominate the scenes they’re in and come off as more memorable than the characters who were supposed to be driving the film. The plot is as weak as the characterization. It’s a generic storyline with no creativity at all. What’s worst though is that it was a missed opportunity to create a true classic. When I saw the trailers to this movie, I thought (my mistake), that I was in for a Dirty Dozen style commando film. The Rebel Alliance assembles a cast of hard-cases and problem troops, and sends them on a series of missions to find the plans to the Death Star, culminating in an amazing raid. I knew going into this that these characters were probably on a one way ticket, and I was feeling upbeat when they broke Jyn out of the work camp. Then it went sideways. What I got instead of an amazing commando raid movie where the characters I came to love through the film give their everything up for a vital win was a badly crafted mess, where there was no reason for anyone to be doing anything. No one talked about anything, there was no development of relationships, nothing. They just all blithely followed along because “The Force” and no one actually plans anything. Everything is on the fly. Jyn’s “inspirational” speech on the flight into Scarif set my teeth on edge; mostly because that’s the sort of thinking that plants soldiers in the ground. But everyone just nodded and went along with it. It felt like they were just ticking boxes instead of building any story or character development. If there’s anywhere that this film shines, it’s in the action department. The last 25% of this movie is loaded with some of the best battle footage I’ve seen in Star Wars. It’s amazing to watch. From the moment the raid on Scarif kicks off, it’s like the movie woke up and remembered how to engage the audience. It was amazing! I could probably write a few paragraphs about it, but seriously, this is the part of the movie that everyone will be remembering in a few years. Particularly the part with Darth Vader. His presence was a refreshing breath of terror as he strode through Rebel troopers, lightsaber working. And the chatter between squadrons, and amazing close air support scenes were a positive delight. The U-Wing fighter/carrier development was cool too, adding a gunship and transport craft that the Rebels needed to flesh out their forces. Lots of cool stuff here. There was one particularly frustrating aspect though. Inconsistent Stormtroopers. I know that there are years of established tropes about them, and their uselessness, but this movie took that to a new height. Until the end of the film, I honestly could not understand how anyone was afraid of them. They took incompetence to bumblingly high levels. On top of that, the Empire in general was pretty shoddy. Poor or no reactions to anything. Nothing was ever manned, no one was ever watching their screens for incoming, nothing. All I could think was that there was no possible way for a military this grossly incompetent to rule anything. Seriously. They can’t maintain security on one planet that’s entirely in their hands. Then, at the end, they’re suddenly decent at what they do, and start laying the boots to the Rebel commando team. It just came as jarring. On that Stormtrooper note though, as an Afghanistan veteran, there was one section I found really jarring. And that was everything on Jedha. Described as a “warzone”, it barely qualified as a low level insurgency, and there just wasn’t any tension there. Also, as someone who has been in questionable scenarios IRL, if a city is ready to “blow up”, you do not see that amount of normal day to day life and activities. Especially prior to an ambush. The locals know what’s up, and don’t stick around to see how nice the crossfire is. And again, Stormtroopers. WTF? If you’re going to keep describing them as highly trained, lethal combatants, and have everyone afraid of them, then stop portraying them as useless cannon fodder. That ambush was a great action moment, but could have been made better by having a competent enemy to raise the stakes. Disney appears to be dedicated to diversifying the Star Wars universe. There was, through the entire film, a mix of males and females, and a mix of ethnicities to be seen. That said, the core characters of the film are still both white, and all the minority cast members are in supporting roles. The droid, K-2SO, voiced by Alan Tudyk, has more lines than any of the minority cast members. There was also the pointless death of Saw Gerrara. Apparently important to the plot, Forest Whitaker’s character decided to “stop running”, even though he had apparently not been running for decades as he fought the Empire, and died in the test firing of the Death Star. For all the work up they had around him, and actual effort to bring him up as a plot component, he turned out, much like Finn last year, to be completely superfluous to the actual plot of the film, and could have been replaced easily without lessening an already mediocre film. Given his apparent mental state, I also question whether he was actually running anything. I appreciate the efforts of diversification, but Star Wars is starting to be a little The Walking Dead-ish around its POC characters. This is not a good movie. It’s not a bad one, but it stands more as a lost opportunity to make a classic than as anything else. The movie’s over reliance on simplistic messages about “hope” is saddening, as it the continued use of “The Force wills it” as a crutch for why characters do anything. Where the film franchise could have expanded into a more mature realm still in keeping with the genre and PG13 rating, it instead choose to dumb it down further. For its few gems, such as the return of James Earl Jones as the voice of Darth Vader (he has lost his touch at all! ), and the amazing battle at the end, this movie is a neither a milestone, nor an amazing, all sins for the previous prequels are forgiven, creation. There’s an additional problem though, and that’s a reliance on other media to tell the story and establish things. Now, I know I’ve talked about how good this is in the past, with Gravity Falls as an example. Or wished that films like Suicide Squad has done something cross-platforms to reach out. This film did, but not in a good way. 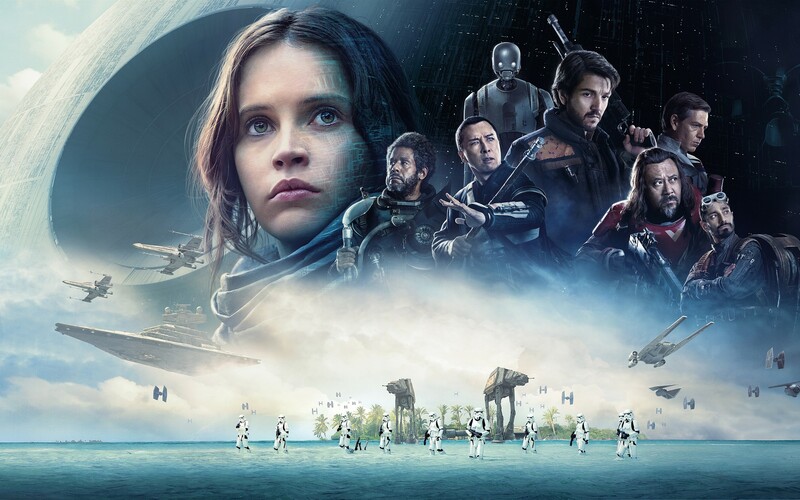 Apparently, to understand the movie and the motivations of the characters, you have to have watched the Rebels series of cartoons on Disney XD, and read the novel “Catalyst: A Rogue One Novel” (released on 15 November, 2016). It’s the right idea, but poorly executed. Instead of seeing sweet links to Youtube exclusive videos or other easily accessible media, I find out via research for this article that to understand the movie, I had to watch 48 episodes of a CGI cartoon, then read a novel. I’m a Star Wars fan, but not that much of a fan that I’m going to burn that much time on it. I have other blerd things to do! In summation, in the annals of Star Wars, this movie will be remembered for its final battle sequence and purchased because people want a complete Star Wars set. Unfortunately, because of the size and scope of the Star Wars fandom, it will be a box office success and be subject to a lot of non-critical puff pieces as various media outlets race to see who can gush the hardest about it. Good ideas, poor execution, lazy writing, and a good battle scene. This movie is fun to watch, visually appealing, and worth seeing on the big screen, but not worth the full price of admission. Go on a matinee night or afternoon.